Join us for an afternoon of outdoor fun. 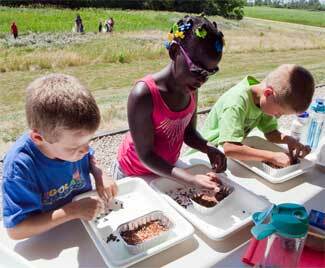 Families explore the outdoor world at Fermilab through hands-on exploration with nature. Watch video of a former event. Visit a real bison herd. Compare yourself to a bison. When: Sunday, June 9, 2019, 1:00 PM4:00 PM. The Outdoor Family Fair is co-supported by Fermilab Friends for Science Education and the Education Office.